One of our favorite appetizers is Baked Feta - feta cheese baked in marinara. I've been trying to think of how to incorporate it into a main dish, and I came up with this Mediterranean Chicken Pasta. 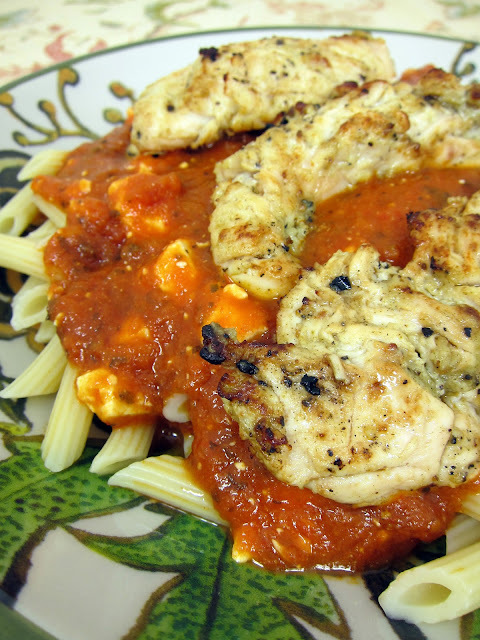 It is pasta, feta, marinara and grilled Greek chicken. The chicken was marinated in herbed Greek yogurt and olive oil mixture. It was the most tender chicken we've ever had and could be a meal in itself. We both agreed that this was a keeper. Enjoy! In a medium bowl, stir together the olive oil, Greek yogurt, Greek seasoning, lemon juice, white vinegar, and pepper. Place chicken in the gallon size ziplock bag, and stir to coat with the marinade. Cover and refrigerate for at least 8 hours (all day). Grill chicken for 8 to 12 minutes, or until the chicken is no longer pink in the center, and the juices run clear. While the chicken cooks, boil the pasta. Drain and set aside. In a large saucepan heat the spaghetti sauce. Add feta cheese and simmer for 5 minutes. To serve, divide cooked pasta between pasta bowls. 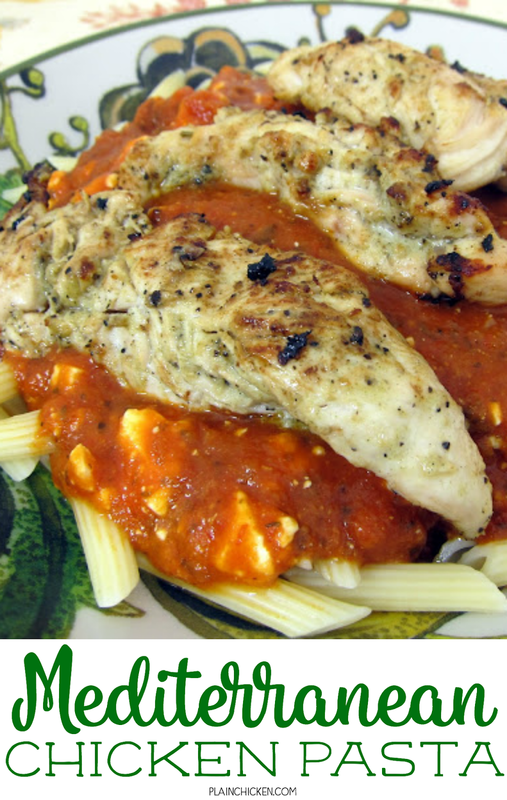 Top with sauce and chicken tenders. The Chicken texture & color is beautiful! Its Saucy & tempting. Nom nom nom ! Excellent sounding dish, Steph. Yogurt rocks as a marinade and this entire dish goes together so well. The pasta dish is quite exquisite. The ingredients are fresh and this makes the dish special. Maybe a side of chardonnay to go along with it? I love Mediterranean cuisine since they only use simple ingredients but the out come can be terrific. Thanks. I rated it over at insight vacations for the pleasant vibe of the place. Then the dishes are exquisitely done with fidelity to the Mediterranean taste. A hidden gem indeed and I was fortunate enough to discover it.